Before condos there were co-ops. Co-ops were once the dominant form of community living in both Toronto and New York. Nowadays they have been replaced by condos. 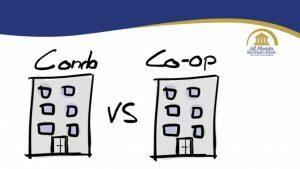 Co-ops are a legal structure where residents are shareholders in the co-op but do not retain legal ownership of their suite. Co-ops have bylaws, and rules as governing documents. In Toronto we rarely hear about co-ops although many can be found when walking through the downtown area. Over 60 co-ops are listed by the Co-operative Housing Federation of Canada in Toronto. A condo, short for “condominium”, is a private residence owned by an individual or family in a building or community with multiple units. There are shared spaces called shared common areas which may include hallways, yards, parking area, lounges and exercise rooms. These spaces are maintained by the condo corporation managing the property. One of the main benefits of condos over co-ops is individual suite ownership. Ownership makes it easier to not only purchase a condo but allow residents to make the space available to other family members or tenants. This is what has propelled the dramatic growth in condos as compared to co-ops. In New York City condos became legal in 1964. While New Yorkers were initially skeptical of condos, their less stringent disclosure rules and ease of trading (selling) boosted popularity. Over the past decade, condos seem to have been the better investment in both Toronto and New York. In New York, co-op prices increased 12% from 2006 to 2015. During this same period New York condos increased by 52%. Today, the distinction between co-ops and condos is less clear. Co-ops are less restrictive while condos are more restrictive. Furthermore, co-ops are finding it harder to refuse entry to potential buyers while condo boards are becoming more restrictive in how they manage their properties.